A table of green apple martinis greet guests at a winter wedding reception at The Patrician in Schererville, Indiana. I very often go back to the same Northwest Indiana and Illinois reception halls over and over again. People ask me if I get bored by visiting the same banquet halls. The answer is no. This is because every couple brings their own little bit of flavor to the mix. I'm always excited to see what my clients are going to do in terms of table decorations, cake toppers and more. I could probably spotlight every wedding I've shot in 2013, but for space I will showcase three different weddings at two different halls. The prominent trends I saw throughout the year were candy buffets along with an emphasis on family photographs throughout the years. As I was photographing all this decor, I often found myself studying these snapshots and admiring the strong family ties that were now coming together on this big day. Greg and Kristen recently had their reception at The Patrician in Schererville, Indiana. It was a rocking good time at the reception and a glorious ceremony that was recently feature here, so go check out that article too. When guests arrived at the hall, tables of decor that featured family photos greeted the guests. Among the usual guest book were wish cards to be filled out for the couple to read later. 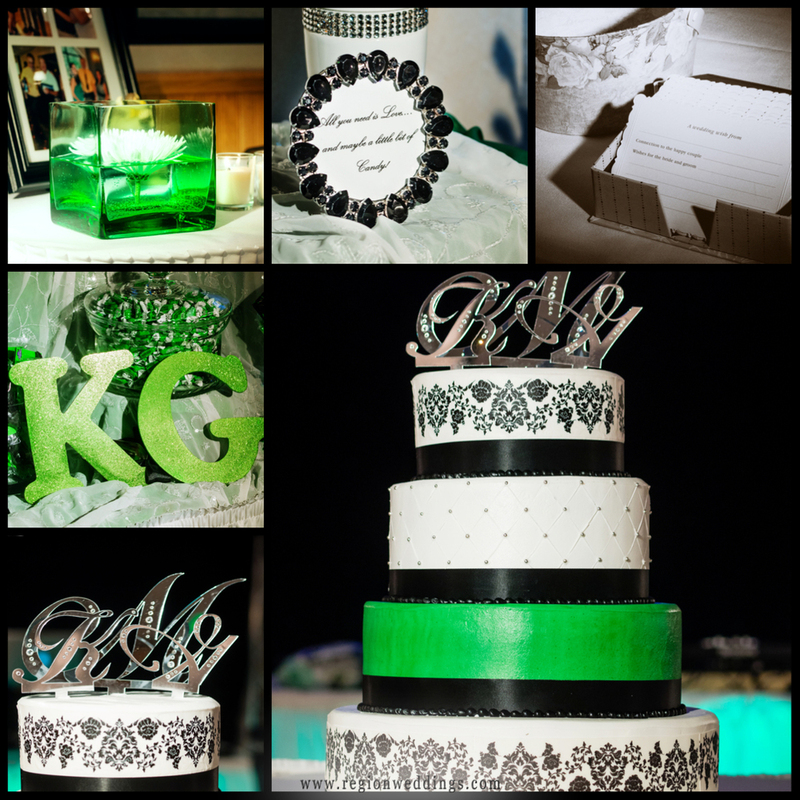 The inside was awash in the newlywed's colors of green, black and silver. The candy buffet from How Sweet It Is Events was a big hit and featured the initials of the couple in big, green candy coated letter blocks - very cool. Green, silver and black wedding decorations at The Patrician banquet hall. This past summer I photographed Evan and Stephanie's reception at Aberdeen Manor in Valparaiso, Indiana. They also had a candy buffet, but hot pink was the color of choice. I have featured their cake here a number of times as it looked fantastic set against the gorgeous uplighting of the room. A gorgeous wedding cake with a pink topper sits inside the ballroom at Aberdeen Manor in Valparaiso, Indiana. The couple adopted another popular trend I saw this year - the signature drink. Here is a great article with recipes for you to develop your very own drink that you can then ask your reception hall vendor to serve for you, complete with your own custom name of course. Cigars in decorative packaging were also spotted quite often this past year. 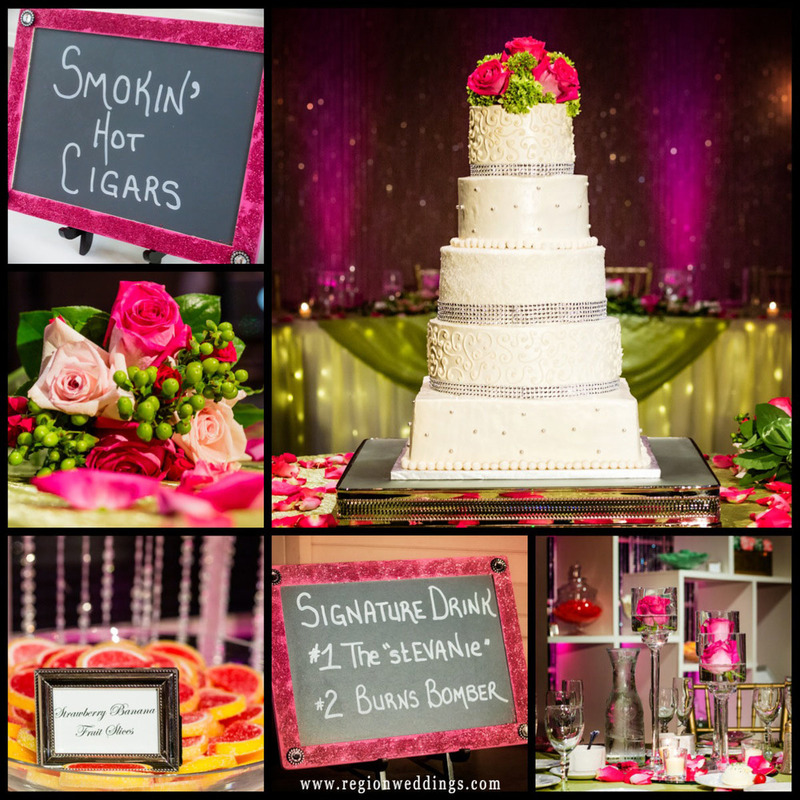 A collection of wedding reception decorations featuring the color pink. Fall weddings often get extra emphasis on decor. One of the most impressive items on display at Ryan and Jamie's Fall wedding at The Patrician were the table cards made by the bride's father. The hand carved flat logs of tree bark were decorated with burnt orange with an attached guest name. It was very impressive and one of my favorites of the year. The retro film camera on every table is a classic and the owl kept an eye on guests as they filled out cards to attach to the wishing tree. A collection of rustic wedding decorations in Autumn colors. As you plan your 2014 and 2015 wedding, take some of these ideas with you and add your own flavor as well. I can't wait to see what you come up with so I can capture if forever with my camera. Have fun!! Wedding cake decorated with Autumn leaves and and Fall colors.